Gladstone, NJ – The 2012 USEF National Para-Equestrian Championships held in conjunction with the USEF Para-Equestrian Dressage Paralympic Selection Trials came down to the slimmest of margins this afternoon as riders performed their Freestyle tests at the Pine Meadow location of the USET Foundation. Heading to the final test of the championships only a few marks separated the top three riders and the remaining 20% of the final score would be determined Wednesday. Rebecca Hart, Jonathan Wentz and Donna Ponessa all produced their highest scores of the competition in the Freestyle and less than a half of a percentage point would separate them in the final standings. 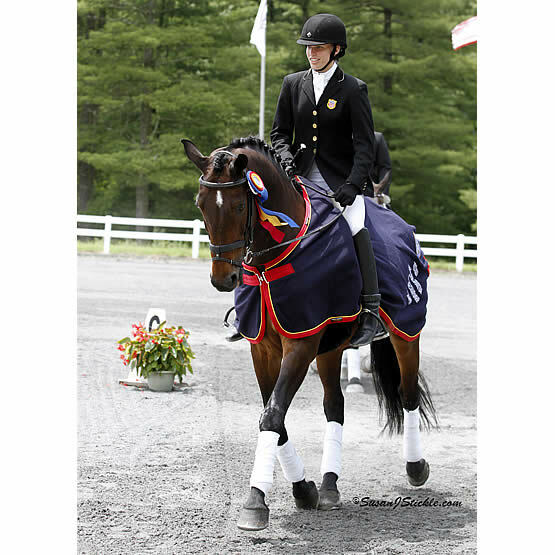 Hart (Unionville, PA) produced the highest score of the National Championship, a 75.917%, to claim her fifth USEF National Para-Equestrian Championship title. The 26-year-old performed an extremely polished and stylish Grade II Freestyle with Jessica Ransehousen’s veteran Lord Ludger accented by a high degree of difficulty. Hart has spent the last year getting to know the Holsteiner gelding and believes that their enhanced partnership paid dividends this week. Heading into Wednesday’s final test, Hart felt the pressure as there was no breathing room between the top three. Hart is now poised to represent the U.S. at her second consecutive Paralympic Games after topping the Selection Trials. However, she is not going to get overly excited until she is actually in competition. The 2011 USEF National Para-Equestrian Champions, Jonathan Wentz and NTEC Richter Scale, settled for Reserve honors after scoring 74.833% in the Freestyle. Wentz (Richardson, TX) demonstrated an elaborate Freestyle utilizing Irish music to compliment Kai Handt’s Shire cross gelding’s gaits. The Grade 1b competitor has been riding NTEC Richter Scale for more than three years and couldn’t be more proud of his longtime partner. Finishing in third place was Grade 1a competitor Ponessa and Wesley Dunham’s Western Rose. The pair scored 73.833% in their Freestyle by way of a high degree of difficulty. The pair demonstrated beautiful trot movements, which are not required but rewarded in Grade 1a. Grade II rider Sydney Collier was the sole competitor contesting only the National Championship, as at 14 years old she does not meet the minimum age requirement to compete in London. Riding in her first USEF National Para-Equestrian Championship she impressed many with her imaginative Freestyle riding Kristi and Sue Niblo’s Otto to a 63%. Hart, Wentz and Ponessa were all winners of the Freestyles in their respective Grades. In Grade III competition Wendy Fryke won her third test of the week with her own and Michael Fryke’s Lateran; they scored 69.75% today. Mary Jordan and Deecie Denison’s Sebastian swept all Grade IV tests and rode to a 69.833% in the Freestyle.